Eversoft's Service Department is available Monday thru Friday and provides 24 hour on call emergency service. 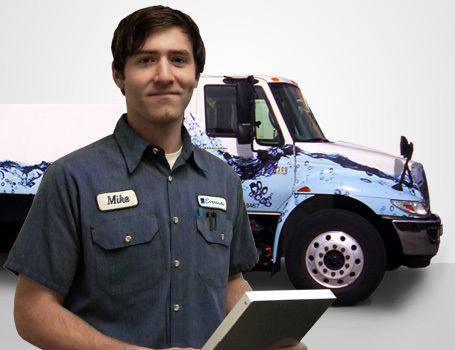 We also have an on-site technician available to assist you, your contractor, or your plumber with any questions. We also provide walk though instructions over the phone at no additional cost! Our customers are recognized as our most valuable asset and we promise to always provide value, fairness, and integrity in everything we do. Our highly trained field service technicians can troubleshoot your water softener or filtration equipment in a matter of minutes and repair it onsite, as we keep our warehouse and service vehicles fully stocked with parts. Whether your equipment is leased or customer owned, we can service and repair your equipment at an affordable price. Our service includes a hard water analysis and equipment inspection. All findings and repairs are documented and reviewed with your location manager as well as logged into our system database. Eversoft has qualified vendors accross the nation that can provide service and periodic maintenance on your equipment. Contact our office for local vendors in your area. Our fully stocked warehouse makes it convenient to have your parts shipped to you within a few days. If your unsure of the part you need please contact our office. Our highly knowledgable staff will assist you with obtaining the proper part.